Electronic cigarettes are growing in popularity as current smokers find they can get their nicotine fix by inhaling the vapor produced by these devices. More concerning to health officials is the growing use of e-cigarettes by teens and young adults. Not only do health officials worry e-cigarettes could eventually lead to smoking, they are increasingly focusing on the chemicals that are present in e-cigarette vapor. Researchers writing in the American Chemical Society (ACS) journal Environmental Science & Technology looked at what happens to e-liquid flavorings when they're heated up. Their study reports some flavorings, when vaporized, break down into toxic compounds. These compounds, they say, tend to exceed occupational safety standards. The researchers say knowing what compounds are present in e-cigarettes isn't enough. They say there needs to be more information about how these chemicals change once heated to the point of becoming water vapor. The study cites previous research that has shown that subjecting e-cigarette chemicals to heat produces aldehydes and other toxic compounds. In this study, the researchers wanted to focus on what happens when flavoring agents are heated up. They tested a wide range of e-cigarettes, some with flavorings and some without. They found the amount of potentially harmful compounds produced by heat varied widely across the different products tested. In general, however, the researchers concluded that just a single puff of flavored vapor contained levels of aldehydes exceeding the safe thresholds for occupational exposure by factors of 1.5 to 270. 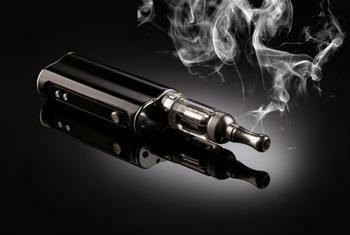 Unflavored e-cigarettes produced significantly lower levels of aldehydes. According to the American Lung Association, there are 500 brands of e-cigarettes on the market with 7,700 different flavors. While e-cigarettes now fall under Food and Drug Administration (FDA) regulation, the association says it could be another two years before the FDA has a full grasp on the chemicals present in these products. The Lung Association also has raised concerns about flavorings used in e-cigarettes, saying just because they have been safe to consume in food does not mean they are also safe to inhale.